"At a time when the price of energy continues to rise, affording to keep homes warm becomes an issue that unites a broad range of families, but the burden is disproportionately devastating to low-income residents. MHC is dedicated to ensuring safe, fair and affordable housing choices for all residents, which includes utility costs." As the KY General Assembly convenes this month, your voice is needed to help make the case for Clean Energy policies in Kentucky. The Kentucky Sustainable Energy Alliance is encouraging our members to set up in-district meetings with your State Representative and/or Senator on January 29th. (If you can't get an appointment that day, try for a meeting any time during the week of January 28-February 1st). These conversations are valuable opportunities to build relationships with lawmakers and discuss the benefits of policies to expand energy efficiency and renewable energy in our state. To help you prepare for an effective conversation with your legislator(s), we are offering a webinar at 8 pm EST on Thursday, January 17th. We'll review key messaging points, examples and data about the case for clean energy policies in Kentucky. And we'll discuss steps you can take to set up a meeting with your local legislator before he or she returns to Frankfort in February. Interested? Follow this link to sign up for the Jan 17th webinar and express your interest in organizing or participating in an in-district meeting with a local legislator in late January. We'll follow-up with more information to help you get started. We have an opportunity right now to curb energy costs and create thousands of new jobs by growing Kentucky's clean energy resources and taking measures to save money by saving energy. Please sign up today to make your voice heard! The Midwest Renewable Energy Association (MREA) has 2 workshops coming up close to us! If you want some job skills for the new green economy or are considering a system for your home, farm, or business, check them out. Registration fees are very reasonable & support a terrific organization doing terrific work. Click the links below for details. In this half-day course, participants will receive a broad overview of what renewable energy is, how it works, and what it can do for you. Topics will include passive solar design, solar electric systems, solar thermal systems, and wind electric systems. This one-day course uses a combination of lecture and classroom activities to teach the basics of solar electric systems. Participants will learn how photovoltaic (PV) systems work, diagram the four PV system types, describe and identify components, understand the best application and limitations of each system type, define the solar window, make energy efficiency recommendations, estimate system loads, and understand the basics of PV site assessment. “If anyone tells you solar energy doesn’t work in Kentucky, they are wrong. It’s all about a balance of what you use and what you produce,” says Sam Avery. And he has the proof. His farmhouse in Upton, Kentucky, touts several solar features, including a water heater, thermal heating system and rooftop photovoltaic panels. Sam and his wife, Bonnie, built the house in 1978, shortly after purchasing the tract of land in Hart County. Along with a couple dozen friends, they did so as a part of the “back to the land” movement. Sam incorporated passive and active solar into the design of the home from the start. “These things just seemed common sense to me when I built the house,” Sam said to a crowd of 35 that gathered at his farmhouse on Friday, July 6. A mix of farmers and friends toured the farm to learn about how each of the home’s renewable energy systems works. Several people climbed up on the roof to see the solar panels and the large tank in the attic peak that holds the home’s hot water. Another group walked down the hill to understand how the electric-free hydraulic pump that brings water up the hill from a nearby stream works. Through his business Avery and Sun, Sam, a trained installer, has put solar systems on other homes in the area as well. Two years ago, he installed a system on the home of neighbors Wendy and Dennis Price that produces as much electricity as they use. Wendy likes how easily the solar panels replaced their reliance on coal-burning grid-based electricity. “You don’t notice anything different at all, except a few clicks at dawn and dusk when the system comes on and turns off,” she said. Everyone at the party was a customer of EKPC’s rural electric cooperatives – living in either the Nolin RECC or Farmers RECC district. As a result, the group was particularly interested to learn about efforts to Renew East Kentucky, a campaign to shift the rural electric co-ops toward a culture of energy efficiency and renewable energy. Sam noted that getting involved in reforming local electric co-ops is a good place to start advocating for clean energy. “As you know, the co-ops are in fact democratic. But as long as the lights go on, most people don’t think about the fact that we are owners of them,” Sam said. The Averys also encouraged people to understand more about the source of their electricity by lobbying their legislators for better state clean energy policy. Having joined the Kentucky Sustainable Energy Alliance as a business member, Sam has been particularly active in advocating for the Clean Energy Opportunity Act, a bill in the Kentucky legislature that would establish a renewable and efficiency portfolio standard and feed-in tariffs for Kentucky. Sam described himself to the crowd as someone who is not a “joiner.” But he said he continues to volunteer his time around clean energy advocacy because he believes it will work. Frankfort, KY - Distributed renewable energy systems could generate up to 34 percent of Kentucky’s electricity by 2025, finds a new report authored by Downstream Strategies. According to the report findings this new generation would increase energy security in the state, diversify Kentucky’s energy portfolio, and curb energy costs for Kentucky ratepayers. “Electricity prices have gone up 41% over the last 5 years and will continue to rise, threatening low-income families' ability to stay in their homes. We at Kentucky Habitat are not meeting our mission if a family can afford to buy a new home, but then down the road cannot stay in it due to rising utility costs,” says Ginger Watkins, Sustainable Building Specialist with Kentucky Habitat For Humanity. “The report outlines a series of practical solutions that are already out there. Already we’re leveraging some of these solutions in our work, for example Morehead Habitat built a home with heating and cooling costs below $15 per month. Affordable, quality, low-energy homes in Kentucky are not only possible, they’re already happening”. Unlike traditional, centralized electricity generation like coal-burning power plants, distributed energy systems, such as solar panels on homes and businesses, generate electricity in smaller amounts for use close to the source. In addition to being clean sources of power, these systems reduce the amount of electricity lost through transmission and reduce the risk of blackouts. “The Opportunities for Distributed Renewable Energy in Kentucky,” produced by Downstream Strategies of Morgantown, WV, finds that with the right policies in place, Kentucky can provide a significant portion of its electricity through small-scale wind, solar photovoltaics and solar heating and other distributed renewable energy technologies such as combined heat and power systems. Policies like renewable portfolio standards, expanded net metering, feed-in tariffs and updated grid interconnection standards will make developing distributed renewable energy systems much more achievable and profitable for Kentucky's electric cooperatives, businesses and individuals. The Kentucky Sustainable Energy Alliance has supported the Clean Energy Opportunity Act, which would advance policies aimed at boosting distributed energy, in the last two legislative sessions. "The US market for solar photovoltaics doubled in 2011, driven by states like New Jersey and California with strong policies to support renewable energy and distributed generation,” said Andy McDonald, Director of the Kentucky Solar Partnership. “Kentucky should take advantage of the great opportunities outlined in this report to advance solar in our state by passing similar policies. Large scale investments in renewable energy would create thousands of new employment opportunities in manufacturing, sales, installation and other industries." For more information about these policies, visit www.kysea.org. You are invited to join lead author of the report, " Rory McIlmoil, for a presentation about the report's findings. Access code: 8931147. Put this into the box that says “Participant: Join a Conference”. Participate in a KySEA-sponsored webinar on Kentucky's Small-Scale Renewable Energy Potential. Join us as Rory McIlmoil from Downstream Strategies presents the findings in his report, "The Opportunities for Distributed Energy in Kentucky." The report finds that there are sufficient in-state renewable energy resources to provide the annual equivalent of 34% of the state’s electricity generation from small-scale distributed energy technologies alone by 2025. Renewable energy and energy efficiency offer real opportunities for Kentucky to put people to work and get our economy back on track, curb our energy costs, and improve our health and well-being. A study released last year by Synapse Energy Economics suggested that Kentucky can create 28,000 jobs in 10 years in this sector. Tax policy is an essential tool to capitalize on Kentucky's clean energy potential. A Blue Ribbon Commission on Tax Reform has been appointed to study and build consensus around tax reforms that meet the guidelines of fairness, competitiveness, simplicity and compliance, elasticity and adequacy. As part of the process, the Commission will be holding Public Meetings across Kentucky. Kentuckians are invited to share their best ideas about needed state tax reforms--ideas that will shape the Commission's recommendations for the 2013 General Assembly. Clean energy development is an important opportunity for the state's future that tax policy can help support. Use your voice to highlight the important connection between the state budget and the growth of sustainable energy in Kentucky. Please plan to speak up in the meeting near you! 1. Increase revenue fairly in order to improve funding for energy efficiency and renewable energy programs, while not placing additional burden on those Kentuckians already hit hardest by rising energy costs. Kentucky has had successful programs that weatherize homes, provide energy audits, and support pilot projects around renewable energy and energy efficiency. The state plays an important role in helping catalyze new ideas and provide energy services to those not otherwise served, including low-income Kentuckians. Some of those efforts have been funded with Recovery Act and other federal monies. But that funding has now ended or been cut, and the state lacks the resources to continue those successful efforts and maintain our momentum. That is one reason why any tax reform effort should result in more revenue for these needs in addition to the state's many other needs in education, health and other areas. Any plan to raise revenue should also adhere to the Commission's stated guideline of fairness. Low and moderate income Kentuckians are already hardest hit by the rapidly rising costs of energy in our state. They should benefit from additional revenue to support sustainable, cost-curbing energy efforts, not shoulder the costs. 2. Include targeted incentives to clean energy development as part of tax reform. Many consumer investments in clean energy make good economic sense along with the benefits they provide for health and the environment. But sometimes the up-front cost of those investments can be a barrier to consumers and businesses. Well-designed, targeted incentives that reduce the cost to consumers of investments in things like insulation, energy efficient appliances, and small-scale renewable energy systems can help overcome those barriers, and would be a positive addition to a tax reform plan. 3. Eliminate unfair subsidies to polluting energy sources in a tax reform plan. Kentucky provides tax subsidies that unfairly give preference to fossil fuels, and taxes the severance of coal at levels lower than many other states and lower than their true cost to our communities. The state's tax expenditure report lists 19 different tax preferences under the category of "Energy Development and Coal Industry Support" and 14 under the category "Environmental Conservation and Historical Preservation," many of which are also energy or coal related. But these tax preferences receive practically no scrutiny. We could save money for needed investments by closely reviewing these and other tax preferences and eliminating those that move Kentucky in the wrong direction. You can leave written comments on the topic at the Commission's website. Kentucky Tax Expenditure Report: Details just what we have been spending our money on over the years. Impact of Coal on Kentucky’s State Budget: Details that Kentucky spent $115 million more on coal (through direct spending and tax breaks) than we brought in from revenue from coal in 2006. By Mountain Association for Community Economic Development. Republished from Kentuckians For The Commonwealth, a KySEA member. A new national survey shows overwhelming and bipartisan support for clean energy policies that go far beyond what is currently in place, especially in Kentucky. More than 80 percent of the 1,019 people asked agreed with the statement: “The time is now for a new, grassroots-driven politics to realize a renewable energy future.” The favorable response included 69 percent of Republicans, 84 percent of Independents, and 95 percent of Democrats. 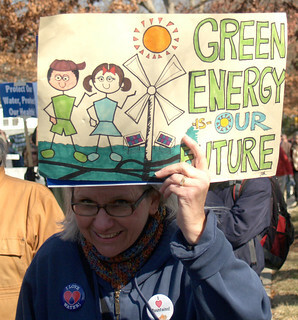 Nearly as many respondents (75 percent) agreed that “Congress and state public utility commissions that regulate electric utilities should put more emphasis on renewable energy and increased energy efficiency … and less emphasis on major investments in new nuclear, coal and natural gas plants.” This included 58 percent of Republicans, 84 percent of Independents, and 86 percent of Democrats. “These results show that people all over the country want clean energy and it’s time for Kentucky to catch up with other states to make cleaner energy affordable and accessible to people who want to invest in that,” said Amanda Fuller, a KFTC member in Louisville. “Renewable Portfolio Standards and feed-in tariffs are two initiatives that we can do right now that don’t cost our state any money,” Fuller pointed out. Those initiatives were included in the Clean Energy Opportunity Act, legislation that received a hearing but no vote in the recently adjourned session of the Kentucky General Assembly. An independent study released in January concluded that passage of the Clean Energy Opportunity Act would result in 28,000 new jobs in Kentucky over the next 10 years. The clean energy survey was conducted by phone March 22-25 by ORC International for the Civil Society Institute. Respondents were 506 men and 513 women 18 years of age and older. The questions went well beyond a simple "Do you favor or oppose ____ policies" often taken in such surveys, explained Pam Solo, president of the Civil Society Institute. She said the results show how deeply Americans understand what's at stake in our energy decisions. A report with the survey findings is available here. Interested in learning more about the primary bill that KySEA supports - the Clean Energy Opportunity Act? View a video podcast of the "Introduction to the Clean Energy Opportunity Act" webinar KySEA hosted on January 19th, 2012 here. The Kentucky Solar Partnership and Appalachia – Science in the Public Interest, with the support of the Mountain Association for Community Economic Development (MACED), Johnson Controls, Inc., the Franklin County Cooperative Extension Service, and Kentucky State University, present a series of introductory and advanced training classes on solar photovoltaic system design and installation practices. Full workshop descriptions and registration information can be found at www.kysolar.org. Financial support with low-interest loans covering up to 100% of registration fees plus grants for travel expenses is available to residents of eastern Kentucky, thanks to the support from MACED. Instructor: Bill Guiney, Director of Solar Heating & Cooling, Johnson Controls, Inc.
Prerequisites: Introduction to Solar Photovoltaics or equivalent prior training or experience. To learn more, contact the Kentucky Solar Partnership at 502-227-4562 or solar@kysolar.org. NABCEP Training Hours: Participants will earn training hours to use towards the eligibility requirements for the NABCEP Solar PV Installer certification exam. CEU’s available for Kentucky licensed Master Electricians and Electrical Electricians for Introduction to Solar PV; Solar Site Assessments and PV System Design; and Solar PV and the National Electric Code. Kentucky's legislature missed a great opportunity in this year's session to help farmers and rural communities. As both a seventh-generation family farmer and a young farmer in Meade County, I know firsthand that energy has increasingly become an important and costly factor in our operation. We use energy every day on the farm. Energy is the fuel for our tractors and trucks. It is the electricity that runs our irrigators and refrigerators, and it lights our barns and homes. And these days especially, the cost of using energy adds up quickly. Things are beginning to change. Increasingly, farmers like me see the opportunity to turn energy into an on-farm asset instead of being an off-farm liability. For instance, on my farm we have used Kentucky Agricultural Development Fund grant money to power our irrigation pumps with solar energy. Kentucky could do so much more to help farmers and rural communities offset energy costs. We could even turn energy into another farm product. I, and the other members of Community Farm Alliance, endorsed House Bill 167 and House Bill 187, as a reasonable way to create new jobs in our rural communities and put Kentucky on track for a secure energy future. HB 167 would have set modest goals for renewable energy use and energy efficiency in Kentucky similar to what 29 other states have already done. It also would have provided market incentives that help farmers like me become energy producers, making my family farm more profitable and Kentucky more energy secure. HB 187 would have expanded Kentucky's net metering law from its 30-kilowatt limit to increase the ability of businesses, schools, local governments and farmers like me to produce their own power. Net-metering allows Kentuckians to connect renewable energy systems like biomass, solar, wind or hydroelectric to the electric grid. When a system generates power, some or all of it is used on-site. Any excess flows back to the grid and is credited to the customer's account. Customers do not get paid for producing excess power. That bill also would have allowed us to partner with investors to produce our own power, something that cash-strapped farmers could really use. Regrettably, both bills once again received a "for discussion-only" hearing in the House Tourism Development and Energy Committee. This missed opportunity is upsetting. As my generation looks to the future, too many of our leaders appear to be stuck in the past. More than 50,000 commercial and residential electricity users in Cincinnatians hired a new electricity company this week - one that aims to power the city on 100% clean energy. Cincinnati is the first city in Ohio and the first of its size to move to 100% clean energy. The city's manager expects the average eligible household's bill to decrease by $133 as a result. The customers will leave Duke Energy, which relies heavily on coal-burning power, and go to First Energy Solutions. A portion of the city's power will now come from local renewable sources, such as rooftop solar and solar power from the Cincinnati Zoo Solar Canopy project and the rest will come from renewable energy credits. Ohio has local renewable energy projects to provide electricity in part because of its state Renewable Energy Portfolio Standard - a policy similar to the one KySEA supports passing in Kentucky. Renewable Energy Credits (RECs) are generated when renewable energy comes online in the grid somewhere else and First Energy Solutions will purchase them in the amount needed to offset the remainder of the city's electricity use. RECs are a market mechanism that supports the growth of renewable energy projects. When given a choice on the ballot last year, Cincinnati residents overwhelmingly voted to allow the city to bargain for electricity on behalf of its residents. This enabled the city to drop its contract with Duke and to find a new provider. Ohio's utility market, unlike Kentucky's, is largely deregulated, allowing such a ballot effort to go forward. Taggart Solar LLC recently announced that it plans to locate a manufacturing plant in Edmonson County. A $440,000 investment, the plant will sustain 30 full-time workers. The Tennessee Valley Authority, which provides electricity to Edmonson and several other Kentucky counties, offers large financial incentives for renewable energy production in it service area. These incentives make it more attractive for solar manufacturing companies to locate there. The Kentucky Center for the Arts plans to “green” its 76,000 square foot roof quite literally. It will be covered with a special type of soil and sedum plants, which soak up water and provide insulation lowers air- conditioning bills. Center staff hopes to implement a pubic education project along with the new roof. An estimated 500,000 people visit the center each year. Legislators heard testimony today about the benefits of the Clean Energy Opportunity Act (HB 167) during a hearing before the House Tourism Development and Energy Committee. KFTC members and our allies in the Kentucky Sustainable Energy Alliance have made HB 167 a high priority, and many were on hand in the packed committee room to show support. Although no vote was taken, the hearing was an important opportunity to inform legislators and build support for the future. Bill sponsor Rep. Mary Lou Marzian introduced the bill, noting, "Thank you for allowing us to bring this important issue for discussion. This is a piece of legislation about job creation in Kentucky. Twenty-nine other states have passed this kind of policy that is called a renewable and efficiency portfolio standard. These policies have been shown to stabilize rates and create jobs. And those would be jobs that could stay in Kentucky." Rick Hornby of Synapse Energy Economics presented a summary of a report his firm recently did about the potential economic impact of HB 167 on jobs and electricity rates in Kentucky over the next 10 years. "Kentucky is facing an electricity challenge. A number of utilities are looking at retrofitting some coal-fired plants. Some are planning to retire coal plants. Some of those retirements will be replaced with new generation, largely natural gas. Our study projects that Kentucky is looking at increases in average electricity supply costs on the order of 50%. Adding renewable energy and energy efficiency to your mix will help Kentucky turn this challenge into an opportunity. As I say, it will help. There is no silver bullet." The energy efficiency and renewable energy requirements contained in HB 167 could generate 28,000 net new jobs over the next 10 years. Under any scenario – whether this bill passes or it doesn't – utility rates in Kentucky are going to go up significantly. Average electric bills in Kentucky are projected to be 8-10% lower at the end of 10 years as a result of HB 167 than they would be under a business-as-usual scenario. Chris Woolery, who works with the Mountain Association for Community Economic Development (MACED), also testified in support of the measure. "I'm one of those contractors that could definitely have benefited from legislation like this. As a former Energy Star home-builder, I learned about the importance of energy efficiency. Then when the market crashed I went into energy retrofit work." Woolery described his job doing home energy audits and retrofits in eastern Kentucky. "I'm now working with How$mart Kentucky. We work with four rural electric co-operatives in eastern Kentucky to do on-bill financing for energy improvements. With these co-ops we do whole house audits and energy upgrades, and we create a savings that the customer uses to pay for the improvements." reached customers in 23 counties. saving people 25-37% on their bills. savings of $550 per year on average per family. Over 40% of the families the program has worked with are low to moderate income. 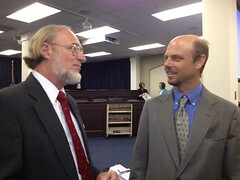 David Brown Kinloch, a renewable energy developer in Kentucky, also spoke before the committee. He emphasized the importance of a portion of the bill – called a feed-in tariff – that is designed to spur investment in renewable energy projects. "A feed-in tariff will allow companies like mine to finance projects and sell power into the grid here in Kentucky. There is tremendous opportunity in Kentucky, and this bill just allows that opportunity to be harvested." The testimony generated a number of comments and questions from members of the Tourism Development and Energy Committee. Chairwoman Leslie Combs from Pike County voiced concern about the troubling projections that utility rates are projected to rise steeply under any scenario. Hornby acknowledged that difficult reality. "I very much understand. It would be nice to be able to come in and say that. But the numbers are the numbers. Kentucky has a big challenge. Over the next several years, no matter what, your rates are going to go up by some amount. What efficiency and renewables can do is give your ratepayers some ability to respond to those increases. If you use less, your bill won't go up as much even as rates rise, and we are going to help you use less." Rep. Keith Hall from Pike County concluded the testimony on HB 167 with a note of praise. "I want to commend Rep. Marzian for bringing this measure before the committee. And to the gentleman who spoke about energy efficiency, that's a very good program. This has been a very worthwhile conversation, and I want to commend the Madam Chairperson for having it." A public affairs program on WMMT-FM, a community radio station based in Whitesburg, focused last week on the benefits of clean energy policies that are currently under consideration in the Kentucky General Assembly. You can listen to the program here. The talk show features Nathan Hall, a resident and biodiesel entrepreneur in Floyd County, and Matt Partymiller, operator of a solar energy firm based in central Kentucky. The two described ways that stronger state energy policies can create jobs across the state and help families, farms and businesses save money by saving energy. Thanks to WMMT-FM, Nathan and Matt, and others who called into the program with questions and information. More than 60 citizen lobbyists came to Frankfort on Tuesday, February 28, to talk to legislators about the promise of clean energy. The Clean Energy Lobby Day was hosted by the Kentucky Sustainable Energy Alliance (KySEA), a coalition of 52 organizations working to pass clean energy policy that would stem rising energy rates and create thousands of new jobs. 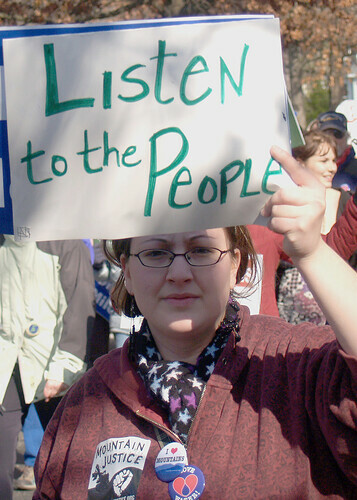 KySEA includes small businesses, faith communities, housing groups, MACED, environmental groups, and even individuals. It was an incredible day. Participants from around the state met with more than 50 different legislators to discuss House Bill 167, the Clean Energy Opportunity Act. Sponsored by Rep. Mary Lou Marzian, the bill would establish benchmarks for increasing the use of renewable energy and energy efficiency in Kentucky over the next ten years. It would also establish payment rates for renewable energy to encourage renewable energy industries to locate in Kentucky and create new jobs. Many surrounding states have already passed such measures, and new jobs in clean energy are going to Ohio and North Carolina instead of Kentucky. Each legislator who met with KySEA representatives was given a packet of information about HB 167 and its projected benefits. Most KySEA participants reported a fairly favorable response from their legislators. The Clean Energy Opportunity Act is assigned to the House Tourism, Development and Energy Committee. One strategy of the lobby day was to press for the bill to get a hearing, and we have learned that our efforts were successful on that. The bill will get a hearing in committee in the next few weeks! So, we ask all the wonderful KySEA activists to stay tuned, and come back to the Capitol complex to attend the hearing. Kentuckians are ready to reap the benefits of clean energy. Energy efficiency and renewable energy solutions are already working in Kentucky to reduce energy costs, create jobs and improve our health and well-being. But new policies are needed before we can realize the full benefits of this transition.. We can’t afford for Kentucky’s workers, families and businesses to be left behind as other states ramp up their investments in one of the fastest growing sectors of our national economy. Your voice is needed to urge Kentucky’s General Assembly to pass HB 167, the Clean Energy Opportunity Act. HB 167, sponsored by Rep. Mary Lou Marzian, asks utilities in Kentucky to gradually increase the share of their electricity mix that comes from renewables and energy efficiency. A recent study projects that over the next ten years this could create 28,000 net new jobs and result in lower average bills, compared to the “do nothing” scenario. A new study estimates that in 10 years Kentucky could create over 28,000 jobs while lessening the growth of electricity bills by passing clean energy legislation currently in front of the General Assembly. A new study estimates that in 10 years Kentucky could create over 28,000 jobs while lessening the growth of electricity bills by passing clean energy legislation currently in front of the General Assembly. Synapse Energy Economics produced the study, which is an analysis of the Clean Energy Opportunity Act (HB 167) introduced by Representative Mary Lou Marzian. Synapse’s study is a high level analysis of the proposed legislation’s impacts on Kentucky’s electricity bills, jobs, and economy. The study concludes that making small but significant steps to begin diversifying Kentucky’s portfolio over the next ten years will lower the bills of Kentucky’s residents, business owners, and industrial facilities compared to their bills without a clean energy standard. Synapse projects that, under the REPS, average annual electricity bills could be eight percent to 10 percent lower than under a do nothing scenario. In addition to saving Kentuckians money, the REPS would lead to over 28,000 net new jobs over and above any jobs lost in fossil fuels and add $1.5 billion to gross state product once fully implemented in 2022. The study’s findings are supported by what neighboring states that have passed similar legislation have experienced. North Carolina has seen tremendous growth in the number of clean energy firms operating in their state since passing an REPS in 2007. Ohio built on the strengths of its traditional manufacturing sector to start building clean energy equipment in state, and reap real economic benefits from their 2008 law. Synapse carried out the study for the Mountain Association for Community Economic Development, a Berea based economic development organization, and the Kentucky Sustainable Energy Alliance, a coalition of over 50 businesses, affordable housing advocates, non-profit organizations and faith based groups. MACED and KySEA wanted to understand the economic impacts of an REPS in Kentucky, and a comprehensive analysis of a bill like the Clean Energy Opportunity Act has not been part of the policy conversation until now. Rockcastle Regional Hospital adds solar power to further commitment in creating a healthy community. This entry is cross posted from the Appalachian Transition blog. Business Lexington has a story today on Rockcastle Regional Hospital's new solar array. It is a great example of a community institution taking advantage of clean energy opportunities in Kentucky--we hope to see other hospitals and community institutions following in the footsteps of Rockcastle Regional soon! Mt. Vernon, Ky - Rockcastle Regional Hospital has become the first hospital in Kentucky to use the sun as a major energy source. The hospital went live with a solar array on November 30, 2011, incorporating solar power into its energy management plan and reducing its reliance on the public power grid. Rockcastle Regional Hospital CEO Stephen A. Estes said the investment fits into the hospital's mission of creating a healthy community. Facilities and Materials Management Director Gary Asher and CEO Stephen A. Estes with the new solar panels. "We've built our organization on forward-thinking innovation. Now we've applied that mindset to energy management, and it creates a win-win for us and the community in the long term," Estes said. "As corporate citizens, we feel an obligation to conserve energy, and doing so frees more resources for patient care and wellness initiatives." Discussions took place with several companies and Green Earth Solar of Knoxville, Tennessee was awarded the contract. Green Earth Solar was launched in 2006 and has completed dozens of solar projects including dairies, manufacturing facilities, restaurants, parks and residential areas. Rockcastle Regional is the company's first hospital project. Two hundred and ten solar modules have been installed on the roof of the hospital's Outpatient Services Center. The modules will produce around 290 watts each (60.9 kW total) and will account for enough energy annually to power eight to ten homes. Kentucky Utilities will purchase the power generated. The solar panels essentially will power the third floor of the Outpatient Services Center, which is a space that will be utilized for community wellness events. The panels will also provide an educational experience for local students. The American Council for an Energy Efficient Economy (ACEEE) recently ranked 37th out of all states on its annual state energy efficiency scorecard. This represents a step down from previous years’ rankings. In 2010, Kentucky was 36th and in 2009 it was 33rd. The rankings are based on an array of metrics including state levels of funding towards energy efficiency and best practices in state energy efficiency policy and program implementation. Sherwin-Williams is the largest producer of paint in the United States today. The company owns over 3,000 stores throughout North America, with one of its largest plants located in Richmond, KY. The Kentucky-based Sherwin Williams plant is doing something unique – it’s leading the way on industrial efficiency. Energy efficiency upgrades to the area's homes and non-profit buildings can save area residents $60 million in lower energy bills and create more than 300 local jobs, according to a study released last month by the Greater Cincinnati Energy Alliance. The study looked at the economic impact of energy efficiency investments to the metropolitan area, which includes the Kentucky counties of Boone, Campbell, and Kenton. Nolin RECC, serving Breckinridge, Bullitt, Grayson, Green, Hardin, Hart, LaRue, Meade and Taylor counties, is the first rural electric co-op in the nation to receive certification from Performance Excellence in Electricity Renewal (PEER). PEER, the world's first certification program that measures power system performance and electricity infrastructure, awarded Nolin the certification in 2018 because of initiatives such as continuous monitoring of power quality, its enhanced tracking of causes for equipment failure and its emergency response plan. Colin hopes it will set an example for other rural energy cooperatives through the certification.